San Diego political, business and environmental leaders rallied Friday to urge passage of a state Senate bill that would allow use of a new four-hour water test to more quickly reopen beaches closed by pollution. The bill, sponsored by Sen. Marty Block, would allow local heath officers to use a new polymerase chain reaction testing method that is approved by the federal Environmental Protection Agency. The current tests take at least 24 hours and sometimes as long as 96 hours. 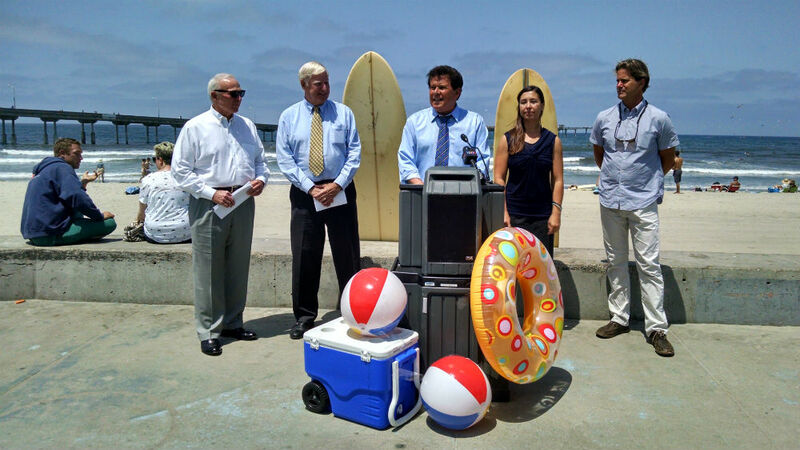 Joining Block at the press conference in Ocean Beach were County Supervisor Greg Cox, San Diego Regional Chamber of Commerce President Jerry Sanders, San Diego Coastkeeper Executive Director Megan Baehrens and WILDCOAST Executive Director Serge Dedina. Dedina noted that sewage runoff from Tijuana nearly closed the beaches in Imperial Beach during the city’s annual sandcastle competition, and only frantic, overnight testing by county health officials allowed beaches to reopen in time. “SB (Senate Bill) 1395 is a game-changer for anyone who goes to the beach in San Diego,” said Dedina, a noted surfer and author. Block praised the bi-partisan effort by San Diego leaders, and noted the partnership between business and environmental organizations. “What’s good for the environment is good for San Diego business,” he said. Water along San Diego’s shoreline can be fouled by runoff following rainstorms or sewage discharged from the Tijuana River. Testing of beach water quality is considered not just a health issue, but an economic one since San Diego’s beaches are a major draw for tourists. The state Assembly Appropriations Committee is scheduled to hold a hearing on the legislation on Aug. 6.